This week, I’m going to talk a bit about how folks who want to pursue traditional publishing can find a publisher on their own. If you read my find an agent post, this process is going to sound awfully familiar. Step 1: Do your homework. Find publishers who have published books like yours. The easiest way to find publishers who like to work with authors like you is to look at already published books that are similar to yours. Step 2: Consult Dr. Google to find the publishing house’s website, Facebook page, Twitter feed, and/or blog. Browse the sites to learn whether or not those publishers accept unsolicited queries directly from writers. If the publisher isn’t accepting unsolicited queries, submitting to them is at best a complete waste of time. Step 3: Make a note of the publisher’s submission guidelines. You’ll want to follow them precisely when the time comes. Step 4: Follow the publisher’s Facebook page, Twitter feed, and/or blog for a while to get to know their likes and dislikes about working with authors. 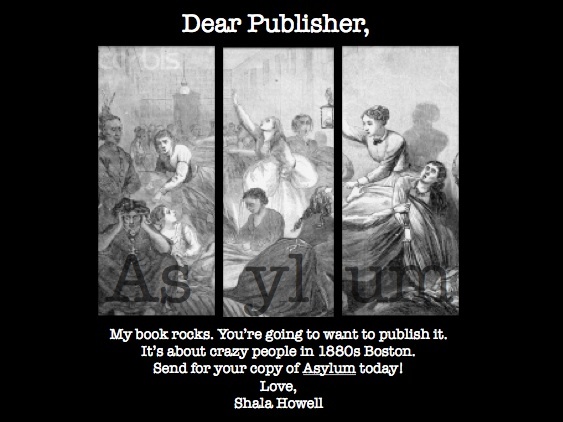 If you are targeting a small press, you will want to be very specific in your query letter about why you wish to be published by this press in particular. Following them on social media for a while can help with that. Step 5: Read the books you’ve found from that publisher (if you haven’t already). Make a list of the things that your book has in common with the one(s) you’re reading. You’ll need to know this later. Ultimately, you’ll want to have between 10 and 15 agents and/or publishers on your targeted query list. Once you have that, you’re ready to get to work on the query itself. Next week: How do I write a query letter? I like your wit. Thanks for sharing your notes. I am a writer, but unfortunately my work has taken all of my writing energy–if consulting reports can be published and sold in the fiction market, I’d be the most prolific writer, ever! I’m slowly working on a fiction novel, and I am beginning to research what to do with it when I’m finished, so your blog posts (which I just found) are very helpful. Thank you, again.